These events started on Friday, July 25, 2014. We did not want to make them public, because of the exchange which took place in the Caracol of La Realidad from 4 to 9 August, so as not to disrupt the great exchange between the original peoples of this country. We just informed the Fray Bartolome de las Casas human rights, Chiapas. But the provocations continued and these are the facts. 1.-A group of 19 people, from the community of Pojkol in the municipality of Chilón, from the organization ORCAO, of the Chiquinaval neighbourhood. We mention some names of these people, they are Andres Gutierrez Guillen, Andres Gutierrez de Meza, Eliceo Ruiz Gutierrez, Guillermo Perez Guillen, Vidal Gutierrez Gomez and Juan Ruiz Gutierrez, the last two names are of those who have vans which transport people; they arrived in the San Jacinto community, which is a community of Zapatista support bases, in the Municipality of San Manuel in the autonomous caracol of La Garrucha. At 6 am, on the 25th of July, they arrived armed and took the reclaimed land, firing into the air. They destroyed the sign which we put up about the assassination of Compañero Galeano. They installed their roofs making out that they would be staying there. At all times they were verbally threatening our compañero support bases with shouts. 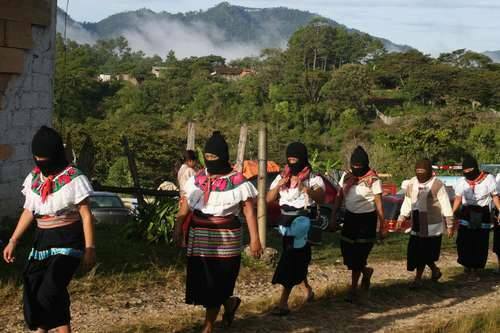 As there are other communities of compañero Zapatista support bases close by, the villages of Egypt and El Rosario, there were threatening with cries that they were going to displace them and return to where their roofs are. On the morning of July 26, at 1:30 am, they left. 2.-On 30th July, they entered again at 6 am, spraying the paddock of 3 hectares with a substance which we do not know, and this is where the collective livestock of the municipality of San Manuel are located, they herded the other animals to take them where they sprayed so the animals would eat the sprayed grass. They wounded a young bull with a knife, near the horn which is the place for killing. They left the legend “Pojkol Territory” written in the earth, in the middle of this area they left the bushes burned in the form of a cross, of a 22 gauge cartridge and 20 gauge shotgun. At 4 pm they left. Those who killed the young bull, arrived on 2 motorcycles, 4 people and they just took away the meat, leaving the bones. 4.-On 6 August, at 7.30 am, the same people from Pojkol arrived with 2 nissan vans, with 15 people with a chainsaw, they arrived firing shots and cut down a large tree, as the tree was falling they began firing into the air, threatening in this way so that no one would come to see them and on leaving they started shooting again in the afternoon. On passing the community of support base compañeros of El Rosario, they fired 5 shots. Again passing the community of support bases of Kexil, 2 shots were fired on the roof of the home of one of base of support compañeros, fired from inside the Nissan vehicle which was heading towards the village of Pojkol. 5.-On Thursday14th August, at 4:50 am, the same 18 people, armed members of ORCAO, came from Pojkol and surrounded the community of compañeros of San Jacinto. They fired guns of different calibres, firing bullets into the walls of the houses, and on to the roofs of the houses, where the compañer@s were sleeping and at the same time the compañer@s had to leave in the early hours of the morning to seek refuge in another Zapatista community, leaving everything, they just took what they were wearing. This was how they avoided being massacred, murdered like in Acteal. When they were leaving the compañeros were hearing the damage that these paramilitaries were doing. 5 houses are cut down, the sheets of laminated metal are cut to pieces with machetes, 50 sheets of laminate. 7 zontes of corn and 130 kilos of corn grains have been stolen. Where is the peace which Peña Nieto speaks so much of? Is this the peace Manuel Velasco talks about? If this happened to the Municipal President of Ocosingo, Octavio Albores, what they are doing to the compañero Zapatista support bases, would he believe that this is peace? They should think if they want peace. Because they are responsible for everything that may happen or will happen. If they are governments as they say, why do they not control those paramilitaries from Pojkol from the barrio of Chiquinival in the Municipality of Chilón? They do not control them because they are the ones who fund, organize and execute these attacks against us. 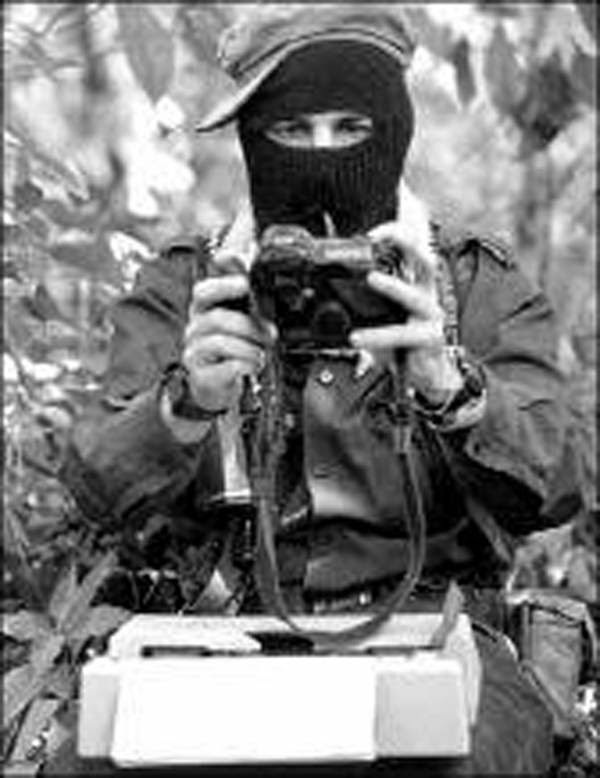 We say to the government and the paramilitaries, who are made of blood, bones and flesh, like us, that we are not drug addicts, like these paramilitaries and yourselves. We say do not manipulate people, do not pay thugs, do not spend money to worsen the lives of the poor which are already bad enough. We truly want peace, if there is no peace we will struggle until there is peace. We do not sell out, we do not give up, we do not surrender. We are organized for a just and dignified peace. You the 3 levels of bad government do not want peace, we know that you do not repent, but you will be condemned by the poor people of Mexico and we are with them. So, compañeras and compañeros from Mexico and the world, we must be vigilant, these savages will come against us and we will be watching.